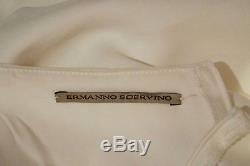 ERMANNO SCERVINO White Tie Pleated Waist Front Vent Fitted Maxi Skirt IT40 UK8. 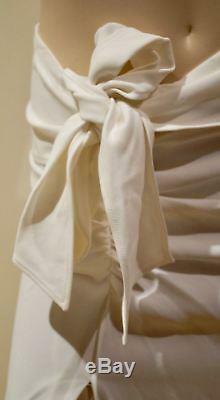 Pleated across the upper front. High vent to the centre front. Zip fastening to the rear. Fabric: 64% Viscose; 33% Acetate; 3% Lycra. All our items are authentic. Note: this is a used item; therefore despite our inspection process there may be minor imperfections. The item "ERMANNO SCERVINO White Tie Pleated Waist Front Vent Fitted Maxi Skirt IT40 UK8" is in sale since Friday, October 20, 2017. This item is in the category "Clothes, Shoes & Accessories\Women's Clothing\Skirts". The seller is "secondwavecouture" and is located in London. This item can be shipped worldwide.